Sol CBD is a small, family-run organization committed to offering the highest quality CBD products at the best prices. They are one of the many CBD brands currently on the market, but aim for their products to be the best in the marketplace and state that they will never compromise on quality. This is very refreshing to hear in a market that is becoming flooded with inferior products. So, does Sol CBD live up to their word? In this article we put Sol CBD to the test and provide you with a full product review of Sol CBD products, including their oils, topicals and edibles. Continue reading to see what we had to say about Sol CBD. Sol CBD was founded by husband and wife duo Larry and Oksana Ostrovsky in 2015. The couple has been working as natural health advocates for over eight years, running a number of health and personal development blogs that are aimed at educating people and raising awareness on the most effective ways to upgrade people’s lives. Larry and Oksana claim to be stewards of CBD and the plant it comes from, and as such promise integrity, transparency, and honesty. On the company website, they go on to state that their mission of helping people and delivering superior products will always trump financial gain. They also vow to provide education so that customers can make informed buying decisions. But perhaps one of the best things about Sol CBD is that they promise to keep their prices as low as possible so that more people can have access to the incredible cannabis plant. 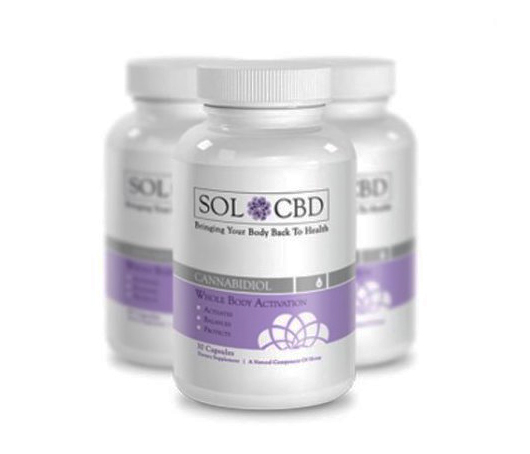 Sol CBD claims that their top priority is the customer and customer service, which is reflected in their desire to provide a smooth and pleasant buying experience. By all accounts, they seem to be genuine in these claims. In all honesty, we couldn’t find much wrong with Sol CBD. But what we do need to mention is that they are not cheap. Although they are committed to offering the best possible price, there are quite a few brands that offer similar products for a significantly lower price. I love the personal touch that Sol CBD adds to customer service. This is a brand that is genuinely all about the customer. There are plenty of brands that claim to care about you, the customer, but quite clearly do not. But, with Sol CBD it’s the real deal. It’s always great to see a brand whose founders are fully involved and committed to the business. For some brands, the owners are anonymous, but Oksana and Larry have been the face of the brand from the start. Tinctures have been used for thousands of years because of their simplicity and effectiveness. The Sol CBD tinctures are available in two different strengths: 300 mg bottles and 3600 mg bottles, which is their extra strength choice. According to Sol CBD, some of the benefits of their tincture oils include reducing inflammation and anxiety, boosting the immune system, optimizing brain health, improving the quality of sleep, and protecting the body. The 300 mg Sol CBD tincture oil is available in both a natural flavor and cinnamint flavor. Each bottle will cost you $65, but you can also get two bottles for $124 or three bottles for $174. Each bottle contains approximately 60 servings, with about 5 mg of CBD per serving. There is 16.7 mg of hemp oil per bottle. The 3600 mg tincture oil is perfect for anyone who needs more CBD per dose. This bottle contains three times more CBD per dose than any of the company’s other tinctures. One bottle will cost you $327, but you can buy two bottles for $618 or three bottles for $867. There are approximately 240 servings per bottle, with 15 mg of CBD per serving. The recommended serving size is ¼ of a dropper. There is 50 mg of hemp oil, and other ingredients include MCT oil (extracted from coconut oil). If you’re wondering how to consume the tincture oil, simply place the drops under your tongue and hold for a few seconds before swallowing. With the 300 mg bottle, you will receive a 1 ml dropper, and you will get a 2 ml dropper with the 3600 mg bottle. Since Sol CBD uses only the purest oil, it should come as no surprise that their tinctures are extremely effective. Some users have even claimed that the oil has helped in reducing pain significantly for conditions such as sciatica. In some cases, users have even reported dumping their pain medication. CBD capsules are one the most convenient ways to take CBD when on the go. This is also an excellent option for people who don’t like the taste of the tinctures. You will get an exact dose of 15 mg per capsule, making dosing easy and efficient. Each 30-capsule bottle contains a total of 450 mg of CBD and will cost $69. Two bottles cost $129 and three bottles $179. The Sol CBD capsules are manufactured from the highest quality, specially bred, organic hemp that is grown in the US. The company uses the CO2 extraction process to ensure that dangerous chemicals are never used. The end result is a pure CBD oil inside a vegetarian capsule that has optimal purity and contains a full spectrum of cannabinoids. The suggested serving is stated as one capsule per day, which will provide many cannabinoids and nutrients including 15 mg of CBD per capsule. It’s a good idea to get into a daily regime to ensure that you are taking your CBD at approximately the same time every day. Sol CBD offers one topical product, and that is their CBD herbal balm. This carefully crafted, unique, maximum strength balm contains 13 powerful ingredients that penetrate quickly and deeply into the joints and muscles for desired effects. These ingredients consist of herbal oils and extracts that have been used medicinally for centuries. Each ingredient was carefully selected to compliment the others and work directly on affected areas. Grapeseed Oil: Packed with Omega 6 and 3, as well as Vitamins C, D, and E, grapeseed oil is great for reducing wrinkles, scars, acne, and stretch marks. Wintergreen Oil: Has the ability to act as a natural antiseptic, analgesic (pain reducer), astringent, and antiarthritic. Blue Mallee Eucalyptus Oil: Used for inflammation and may be beneficial for pain relief, or useful to athletes as a passive form of warm-up. Organic Sunflower Seed Oil: Used topically to improve dry skin and treat skin irritations. Organic Rosemary Leaf Extract: Known for its skin toning, anti-inflammatory, anti-microbial properties. These are just a few of the 13 powerful ingredients, and by all accounts, it appears as though the Sol CBD balm is effective in treating a number of skin, muscle, or joint conditions. This graduated pricing structure applies to all their products. So if you’re willing to buy in bulk you can get a really good deal. As always, we advise that you purchase directly from the company’s official website. Sol CBD is fully committed to providing top quality customer service and are there to help you with any questions or suggestions that you may have. The site is user-friendly, and it’s easy to find the exact product that you are looking for. You will receive free shipping on all orders over $75. If you order is under $75, you will pay a flat shipping rate of $4.95. American residents can expect to receive their products within one to four working days, but Hawaiian residents may have to wait up to seven days. We love that Sol CBD has a vision of bringing CBD to those in need at affordable prices. Since they are such a small organization, they offer only a handful of products, but the great thing is that they are fully committed to only offering the best quality products. We would far rather have less variety and higher quality. And who knows, perhaps in the future they will add more products to their already impressive range. Being a fitness enthusiast I always experience sore and tired muscles. Luckily i found the maximum strength CBD Balm from Sol CBD, which quickly absorbs into the muscles and joints. 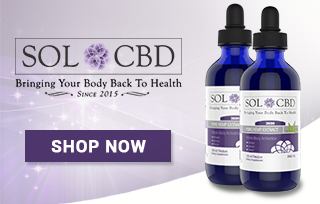 I order my CBD in bulk, so Sol CBD Oil is just perfect for me. 1 bottle costs $65 and 3 bottles cost $174. Whoever thought about putting cinnamon and mint flavor in the same CBD oil is a genius! My favorite flavored oil in the cupboard. I’ve been looking for an effective topical for a long time and after using the CBD Herbal Balm, I think I’ve finally found one I like. I used to suffer from severe wrist pain after heavy workouts. I tried supplementing Calcium + Vitamin D but it didn’t achieve the desired effects. Then i began experimenting with CBD Oil from Sol. The oil works marvelously and I feel less pain in my wrist just after 4 days of usage. Iker from Dallas just bough! Zayne from Dallas just bough! Cash from Dallas just bough!